Late in 1915, a group of about 350 men and 13 armoured cars and other vehicles were transported in British ships from the Belgian coast to the port of Archangel. They comprised the Belgian Expeditionary Corps in Russia, sometimes known as the Belgian Armoured Car Division and more long-windedly, Le Corps Expeditionnaire des Autos-Canons-Mitrailleuses Belges en Russie. The card is addressed to a Belgian soldier interned in the Netherlands, at the Harderwyk [Harderwijk] camp. It was sent from PETERHOF PETROGR on 3 12 15, and transited through PETROGRAD 18 12 15 (where it was censored) and the Dutch VELDPOST 14 1 16. The sender gives his name and address as "Aug[uste] Fileé (? see footnote), Corps des autos Canons Belge, Poste centrale à Petrograde". 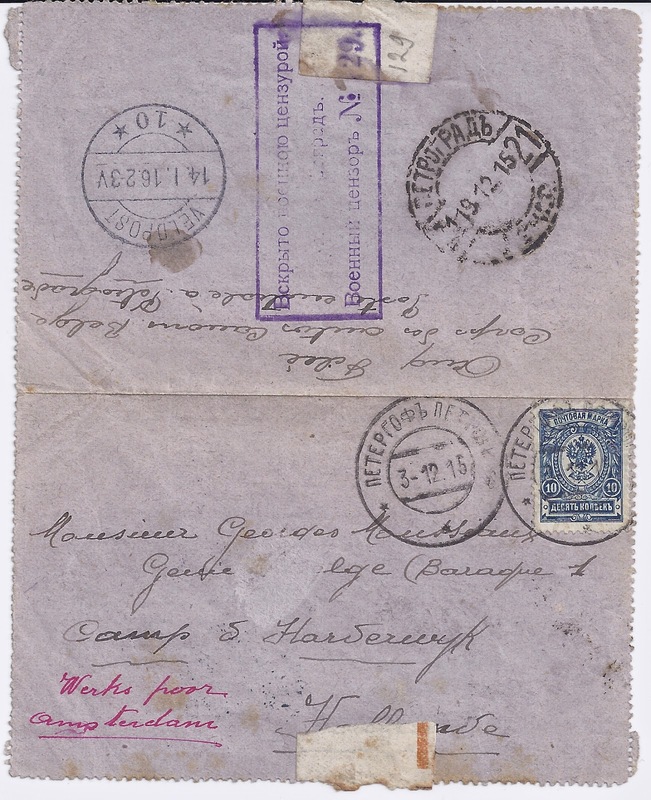 There is no Corps cahcet on this letter-card and it has passed through the civilian mail. 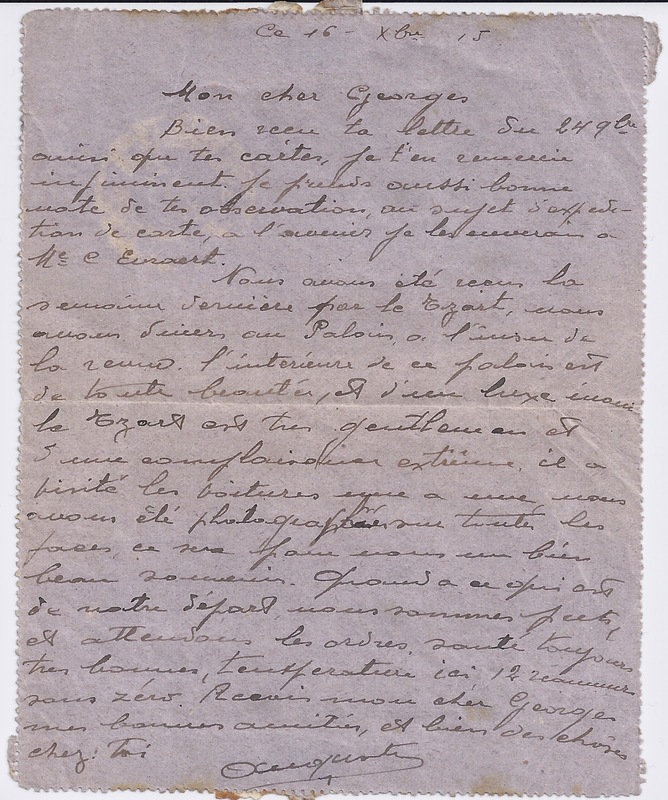 The letter, in French, dated 16 December [New Style, equivalent to the Old Style postmark 3rd December]. It records that the previous week they had been inside the [Winter] Palace "unknown to the Queen" [ " a l'insu de la reine"]. It looks like they ate there [nous avons diner ? though that doesn't seem grammatical ] and that the Tsar then inspected their armoured cars one by one and that photographs were taken which will make a very fine souvenir. As for the future, they are ready and awaiting orders.